Why are Cashews so weird? 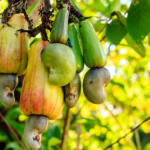 Cashew trees originate in Brazil but you can now find them cultivated in many countries with tropical climates including India, Africa, and many Asian countries. Currently, India and Vietnam are the largest exporters of cashews. Cashews are very weird. 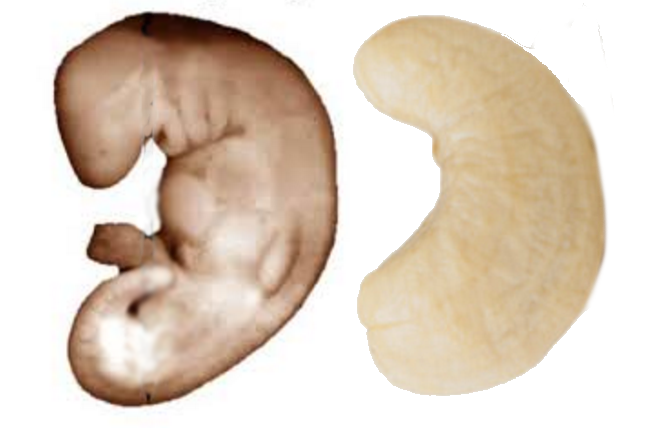 They strangely resemble the same shape of all embryos in nature. Surprisingly, they are not nuts. 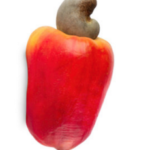 They are harvested from the Cashew apple which looks like a little red pepper. The cashew is a seed that grows outside of the fruit inside a little kidney-shaped pouch that is considered the true fruit of the tree. Raw Cashews contain a toxic resin called Urushiol. It can cause rashes or burns to the skin if touched. The cashew in its raw state is green in color and they must go through a roasting process to make them safe to eat. You will never see cashews with their shell at the grocery store. What’s even more shocking is that they belong to the same family as poison ivy! The part of the cashew that is harmful is the same substance that makes poison ivy dangerous. This is debatable. If you are referring to the vitamins, minerals, fiber, unsaturated fat and protein in Cashews, they pack a lot. But they come at a cost. 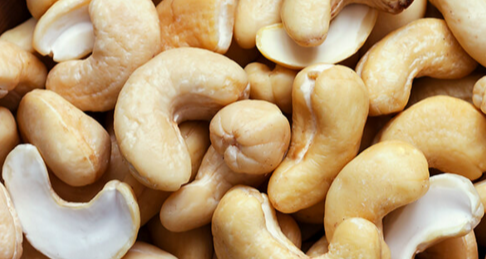 Eating too many cashews (even unsalted) have been known to cause stomach pain since they are a very dense food and hard to digest. Even nuts and seeds need to be consumed in moderation. Cashews can have adverse side effects for those who have allergies or need to avoid magnesium-rich foods. Cashews have a high magnesium content, generally 82.5 mg of magnesium per ounce. Magnesium from cashews may also interact with diabetic medications, thyroid medications, diuretics, and penicillamine. The conditions workers are exposed to while extracting the nut from a poisonous shell are horrific and should not be supported. Workers earn practically nothing for shucking the cashews and many of them suffer permanent damage from the toxic resin that is released. Time Magazine revealed that Vietnamese cashews are the product of forced labor camps staffed by people addicted to drugs. While cashew ingestion as a health benefit is questionable, there are several medicinal benefits that cashews have been used for. Cashew is used for stomach and intestinal (gastrointestinal) ailments. 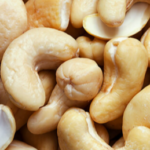 Some people apply cashew directly to the skin as a skin stimulant and to seal (cauterize) ulcers, warts, and even corns. The poisonous resin in the cashew might work against certain bacteria. Lou Corona, Holistic Health Educator says you can eat Cashews only if you soak them overnight. Many nuts and seeds are very hard to digest. If you think about it, one nut or seed is encoded with all the information needed to grow into a huge tree. That is a lot packed in there! It is only when you take seeds and nuts and soak them in water for 24 hours that they are germinated and enzyme activated. This makes it easier to digest and way easier to process; for your metabolism. Many recipes and vegan substitutes for dairy call for cashew milk or cashew cheese. The best recipes are made with soaked nuts first! So Conscious Cashew lovers, eat them after you soak them, don’t eat too many of them and if you can pay a little extra for that peace of mind, get them at Fairtrade markets and buy brands that are locally harvested.